“I’m not changing my business plan”: Are you ready for a $50 billion-a-year juggernaut? Canadian housing as the “snowflake” that triggers a financial avalanche? 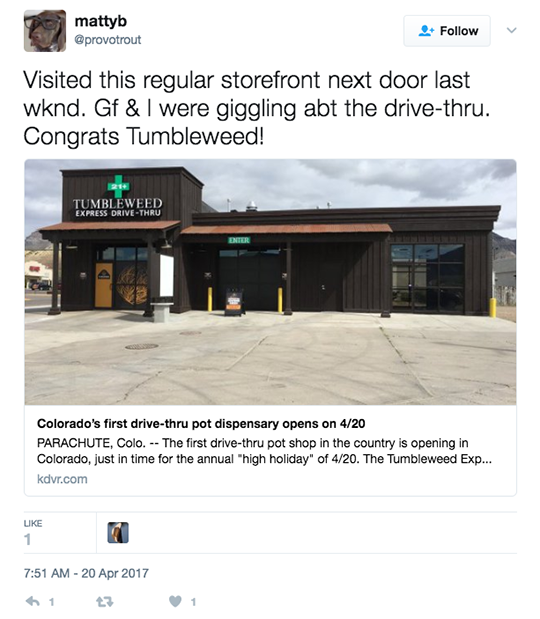 Effective today, 4/20, the Tumbleweed Dispensary is now the Tumbleweed Express Drive-Thru, serving customers in the town of Parachute and elsewhere on Colorado’s Western Slope. Recreational cannabis has been legal in the Centennial State for more than three years now, but only today has access to Mary Jane reached this new level of convenience. Exactly how “4/20” became a thing is a matter of conjecture. “The most credible story,” said Time last year, “traces the date to Marin County, California. It caught on, the story goes, because one of the participants went on to become a roadie with the Grateful Dead… and it snowballed from there. “Marijuana has gone mainstream,” says Rep. Earl Blumenauer, a Democrat hailing from Oregon — another recreational pot state. Blumenauer belongs to a bipartisan group of four House members who formed the Congressional Cannabis Caucus this year — aiming to bring federal law more in line with ever-looser state laws. Marijuana is now legal on some level in more than half the states. The congressman’s claim stands up in a new poll by Yahoo News and Marist University. It finds more than half of American adults have tried marijuana at least once… and 70% of those people support legal recreational weed. Even among those who’ve not tried it, 26% support recreational legalization. Little wonder that legal marijuana sales totaled roughly $6.7 billion last year… and some analysts believe the number could grow more than sevenfold, to $50 billion, annually over the next decade. Ah, but what about Attorney General Jeff Sessions — the unreconstructed drug warrior who only last year said, “Good people don’t smoke marijuana”? But Sessions knows a losing battle when he sees it. That’s affirmation of what we said way back when the president picked Sessions last November. He’ll have to pick his battles with the “blue states.” And he cares a lot more about immigration than about left-handed cigarettes; last week he ordered federal prosecutors — even those far away from the Mexican border — to give higher priority to immigration crimes. “I don’t think they want to pick a fight to be on the wrong side of the American public,” says the aforementioned Rep. Blumenauer. Indeed. 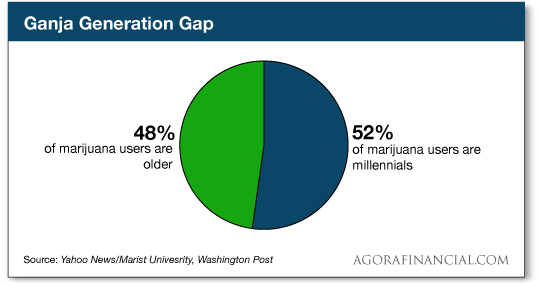 Which brings us to one of the most intriguing results of that Yahoo-Marist poll: More than half of the nation’s 55 million current pot users are millennials. Hmmm… Voter turnout among young people has been sinking in every election cycle since Obama won the first time, in 2008. The last thing Team Trump wants is to galvanize a bunch of nonvoting weed smokers to show up and vote Democrat in 2020. Thus, “I’m not changing my business plan one iota,” says Serge Chistov, an investor in Colorado marijuana farms. Chistov says the boost that legal cannabis has given to Colorado’s economy is undeniable. “This is the winning strategy,” he tells CNN. Many businesses that started out with medical marijuana are branching out into recreational sales. The CNN article cites a dispensary in San Diego and a medical marijuana company in Nevada planning to take that step. Voters in both states approved recreational cannabis last fall. As we said last month, the fuzz won’t be coming for your penny pot stocks, and you won’t have to flush your stock certificates down the toilet. [Ed. note: To commemorate 4/20, we’re offering a one-of-a-kind deal on Penny Pot Profits — our revolutionary premium advisory that uses a proprietary system to identify the moment when a penny pot stock starts going ballistic. That’s how you can lock in gains of 25, 30 or even 50 times your initial investment. To the markets… where stocks are flying “higher” for no obvious reason. All the major U.S. indexes are up at least three-quarters of a percent. The Dow is 15 points away from 20,600, even with an earnings miss by Verizon. Another Dow stock, American Express, is up more than 5% as we write; its quarterly numbers are such that traders are satisfied AXP has moved on from the loss of its credit card partnership with Costco. Gold is treading water at $1.280. The day’s economic numbers are a relief from the doomy dirge of recent days. The Conference Board’s leading economic indicators jumped 0.4% in March. The April “Philly Fed” survey of mid-Atlantic manufacturing remains solidly in plus territory. But overall, “There are some warning signs that are getting darker,” says Larry Fink of the U.S. economy. Fink is CEO of BlackRock, the world’s biggest money manager. Interviewed yesterday on Bloomberg TV, he cited falling auto sales and slowing merger-and-acquisition activity. He pointed out that among the big “G-7” countries, America’s economy is growing slowest — even slower than that perennial laggard Japan. His body language didn’t exude confidence — just sayin’. We pay heed to what Fink says because we well remember a warning he issued around this time in 2014. At the time Fink wrote his letter three years ago, the price-earnings ratio for the S&P 500 was 18.4. Now it’s 26.3. That means investors have become willing to pay more for each dollar of S&P 500 earnings during the last three years — even though Corporate America still isn’t doing much to invest in the future of their businesses. As we’ve pointed out the last couple of days, our own David Stockman figures that’s the best-case scenario facing the markets… and a worse case is far more likely, starting as early as tomorrow. If the government of Venezuela was hoping to buy influence with the Trump administration, it failed miserably. Venezuela, the 21st century’s most poignant reminder that socialism doesn’t work, is back in the news. Huge protests have broken out; the gendarmes protecting President Nicolas Maduro’s regime shot and killed two demonstrators. Inflation, in the estimation of Johns Hopkins economist Steve Hanke, is running 279% a year. But that’s not what caught our eye this week. No, it’s an item at Quartz that tells us Citgo — the American arm of Venezuela’s state oil company PdVSA — kicked in $500,000 for Trump’s inauguration. The information turns up in a new report from the Federal Election Commission. Indeed, we can’t help wondering if Washington has operatives egging on those protests this week; the Bush 43 administration nearly succeeded in backing a coup against Maduro’s predecessor Hugo Chávez in 2002. The reader sends along an article from Bloomberg. It says Bank of Montreal — one of Canada’s Big Five banks — is packaging up $1.5 billion of mortgages into bonds it will sell to investors. “Although it’s happening here in Canada, this looks and smells like mortgage-backed securities mess that triggered the Great Recession,” the reader goes on. “The real estate markets in Toronto, Vancouver and several other markets are very much in huge bubble territory. The 5: Maybe. But they’re not subprime mortgages, and in fact, the program appears to be an effort by the Canadian government to let the air out of the housing market slowly. Whether it works is another matter entirely. We said nearly five years ago that housing prices in Canada were unsustainable, but they’ve risen relentlessly since. Only now are they starting to climb down in Vancouver… but the bubble keeps blowing bigger in the Greater Toronto Area. Given the interconnectedness of everything in finance now, it’s entirely plausible Canadian real estate could be the snowflake that sets off the financial avalanche Jim Rickards says is inevitable. But the possibilities are nearly endless. How about this one: What if Venezuela defaults? The story cites the same figure of the pot sector’s profit potential — $50 billion a year in revenue by 2026, according to analysts at Cowen and Co. But you don’t have to wait nearly that long to capture your share. All you need to do is follow the “penny pot flashes” we issue in our elite-level advisory Penny Pot Profits. When our proprietary system issues a flash, it signals your opportunity to make up to 50 times your money in a matter of weeks or months. It seizes on the volatility in penny pot stocks for maximum gains. To mark 4/20, we’re extending a limited-time offer on Penny Pot Profits. And we do mean limited time. It comes off the table Sunday night at midnight. Check it out at this link.